Rayon, like acetate, is a funky one. It’s sort of natural, but not really – it’s a manufactured fiber, like nylon and polyester, but derived from a natural source. Rayon is a cellulosic fiber. Cellulose – plant cells, usually derived from cotton, wood or bamboo (increasingly popular) – are subjected to a chemical stew and the resultant goop is extruded as a filament. It’s sometimes described as semi-synthetic. It’s got a certain amount of controversy attached to it, which I’ll get into, shortly. I like rayon quite a lot. It can be mistaken for cotton and even silk in some situations. It’s not as much of a heat sink as nylon and polyester are, so it’s more comfortable to wear than either of those two. It can drape as well as some natural fibers but it’s better at resisting creases than natural fibers are – although it will crease more than polyester does. It’s a popular fabric for shirts and slacks and for hot-weather wear. In cosplay terms, it’s very useful as it can take the place of certain, more luxurious fabrics (silk) and comes in a huge range of colors and it’s available both in plain-woven and knitted forms. It’s often blended with natural fibers for the usual reasons – to take advantage of the strengths of all source yarns while minimizing the disadvantages. 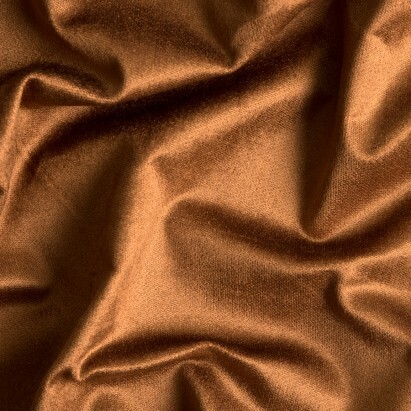 Velvet with a silk base and rayon pile. 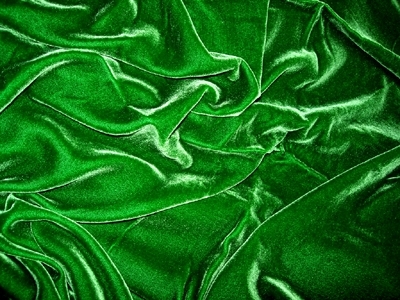 Often sold as “silk velvet” but if it’s less than $300/yd, it has rayon in it. You’ll sometimes see fabric labelled as viscose rayon, or just viscose. That’s rayon which has been produced via a specific method and it can be stronger than regular rayon. It should also only be dry-cleaned – unlike other rayons, some of which can be machine washed with cool water and allowed to drip dry. The controversy of rayon is in the production process. There are some much-touted rayons out there that brag up the fact that they are created from recycled materials. Those materials can be paper, various plastics or – very often – other fabrics. Unfortunately, the process of creating rayon – new and recycled – involves some ferociously nasty chemicals with resultant waste products and pollution risks. Manufacturers vary, but the carbon footprint of recycled rayon can actually be higher than that of virgin fabric. So don’t let someone try to sell you recycled fabric and a premium price point on the grounds that it’s “better” for the earth, as it probably isn’t. The textile industry is slowly cleaning up their act – closing the loop with solvents and recycling them, rather than dumping them into a convenient river and such – but there’s a way to go. Wikipedia tells me that bamboo rayon is better-suited to a closed-loop production process, so if the fabric’s carbon footprint is a factor in your decision, consider it as an option. Right now, environmental regulations are such that only viscose rayon may be made in the US. Other varieties of rayon are made where environmental regulations aren’t as strict – or the textile industry has acquired exemptions from the local authorities. Rayon yarn used to be cheaper than cotton, but because of the costs associated with increased environmental regulations, that is not always the case now. If you encounter fabric labeled lyocell, it’s a type of rayon made from wood pulp. Tencel is a brand name for lyocell – like how Spandex is a brand name for elastane – dating from the 1970s. It’s not very common as it’s becoming more expensive to produce than the fibers it was intended to replace (cotton, viscose rayon). Modal is another brand name for rayon and it’s usually made from beech wood pulp.